Here we go: The first appearance of Skippy in the first Mynarski Forest comic with the first cartoonist's commentary! Skippy's main purpose was to act as a companion/straightman/victim for Liska and thus provide justification for the entire strip. Straightmen play a thankless but vital role in their comedy team by setting up the joke and providing a baseline of normalcy that makes their partners seem so funny. The role is so important that it's often the straightman who is the more talented and better paid member of the act, while their partner gets most of the audience's affection. Gilligan would be a lot less funny if he didn't have such a great Skipper to play off of. Still, I must confess when I first started the comic, most of my interest was on Liska's character and writing for Skippy was a bit of a chore. I wasn't sure where I wanted to go with his personality though I did know he needed to possess certain attributes and perform certain functions: I knew I wanted a rabbit to act as the second half of this "odd couple" since rabbits and foxes generally don't get along with each other very well; he had to provide the voice of reason in any given situation and then be ignored; to react with annoyance, shock, horror, disbelief, and moral outrage at Liska's actions. And he had to be the one who usually ended up suffering because her mistakes. Beyond that though, I didn't really know anything about his personality. The breakthrough came when I found myself subconciously putting little bits of my own personality into his character. I know this guy! He has many of my virtues, shortcomings, and problems, at least on the broader level. Skippy is NOT an avatar, fursona, or Mary-Sue; he is not actually supposed to be me in any way or serve as some form of wish-fulfillment - I've never really been into the whole role-playing thing. But it is easier to write what you know and putting myself in his shoes made develloping the character a more natural process and a lot more fun. The comic was originally scanned from pencil drawings and presented in a greyscale .gif format suitable for a time when 28.8 kbps dial-up modem was the predominent internet connection method. Later on I began to colourize inked strips and re-drew the first thirty or so to match the new format and reflect my evolving style. Click here to see the older version! Here are some never-before-seen sketches of Skippy - never before seen because, as you can see, they're pretty terrible! 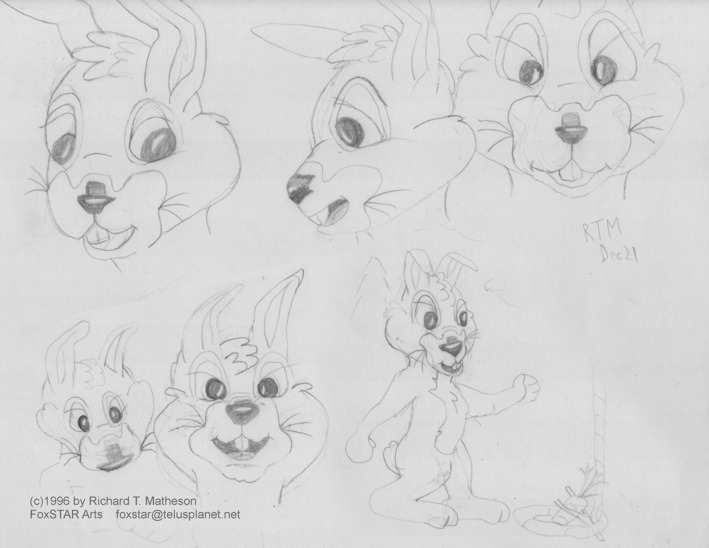 These are the first ever concept sketches for the character that would eventually become Skippy Rabbit. So I guess that makes Dec 21, 1996 his birthday, in case anybody wishes to send presents. Like his personality, Skippy's character design originally took a back seat to Liska's. I wasn't exactly sure where I wished to go with his appearance. I did know he needed to be cute and expressive, and look funny when he was frightened, angry, freaked out, clobbered and/or mutilated. To give myself some ideas, I took some pictures of various cartoon rabbits including Bugs Bunny, Fiver from Watership Down, and Winnie the Pooh's friend, and ran them through a morphing program to get a really horrible composite image. I then did several sketches based on the image, with the purpose of making them look compatible with the character designs I had for Liska at that time. The result was the above sketches. Alhough rather crude, I think they do a pretty good job of showing where Skippy came from. Over time, the design would become much more expressive, simplified and more refined, and the character would gradually acquire his own unique personality.